On arrival at Cochin, you will meet our representative followed by a drive to the selected hotel. You can spend the day free for self-activities. Followed by an overnight stay at the hotel. After breakfast at the hotel, proceed to visit Chottanikkara Temple and Poornathrayeesa temple. Next, you can go for a sightseeing tour, which includes places like St. Francis Church, Jewish Synagogue, and Dutch Palace. You can also take a Harbour Cruise Ride to see the Chinese Fishing Nets. Later, you will be followed by an overnight stay at the hotel. After breakfast at the hotel, drive to Guruvayoor. On arrival, you can check-in at the hotel. Later, you can visit the famous Kodungallur Bhagavathy temple and Guruvayoor Sri Krishna temple – one of the most sacred and important pilgrimage centres of Kerala. Followed by a visit to the Mammiyoor temple and Anakotta – the elephant training center. Later, you will be followed by an overnight stay at the hotel. After breakfast at the hotel, drive to Alleppey. On arrival at Alleppey visit Ambalapuzha Srikrishna temple. 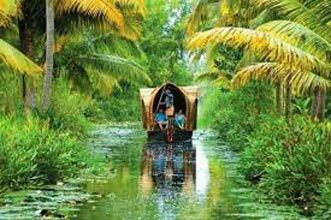 Later, you can board a houseboat and enjoy the magic of backwater by going on a Houseboat (Kettuvallam) cruise across the backwaters. 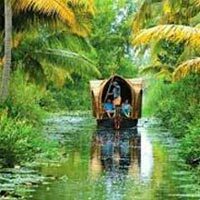 You can spend the next 22 hours in your floating villa enjoying the backwaters of Kerala by getting a glimpse of the village life at close quarters; a unique and unforgettable experience. Enjoy the sunset & stay overnight on the houseboat with breakfast, lunch and dinner all included. After breakfast drive to Cochin. On arrival at Cochin, you will be dropped at the airport to connect flight for your onward destination.